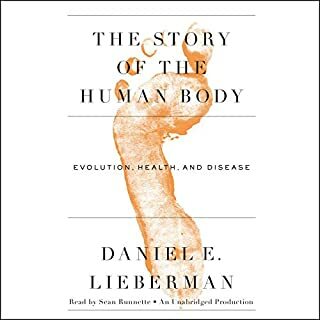 In this landmark book of popular science, Daniel E. Lieberman - chair of the department of human evolutionary biology at Harvard University and a leader in the field - gives us a lucid and engaging account of how the human body evolved over millions of years, even as it shows how the increasing disparity between the jumble of adaptations in our Stone Age bodies and advancements in the modern world is occasioning this paradox: greater longevity but increased chronic disease. In his last book, Neil Shubin delved into the amazing connections between human anatomy - our hands, our jaws - and the structures in the fish that first took over land 375 million years ago. Now, with his trademark clarity and exuberance, he takes an even more expansive approach to the question of why we are the way we are. Starting once again with fossils, Shubin turns his gaze skyward. He shows how the entirety of the universe's 14-billion-year history can be seen in our bodies. 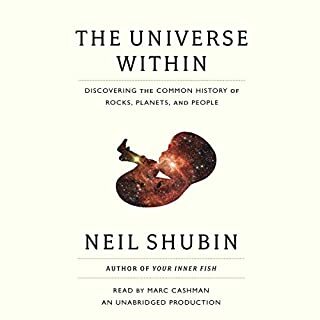 Neil Shubin, a leading paleontologist and professor of anatomy who discovered Tiktaalik, the "missing link" that made headlines around the world in April 2006, tells the story of evolution by tracing the organs of the human body back millions of years, long before the first creatures walked the earth. By examining fossils and DNA, Shubin shows us that our hands actually resemble fish fins, our head is organized like that of a long-extinct jawless fish, and major parts of our genome look and function like those of worms and bacteria. Shubin makes us see ourselves and our world in a completely new light. Your Inner Fish is science writing at its finest: enlightening, accessible, and told with irresistible enthusiasm. Mr. Shubin's humanity comes through very vividly in this book. I found myself sharing his almost child like excitement of scientific discovery. The human failures he makes in his journey to acquire the skills necessary to do his research efficiently and professionally is also revealed. Any person interested in science needs to include this book in their collection. The scientific method is very evident here. Propose a hypothesis from already known information, define the structure of an experiment, and execute the experiment. Consequently, Tiktaalik is discovered. Tiktaalik fills in one more missing link in the theory of evolution. Mr. Shubin combines a number of scientific disciplines to support his conclusions. His knowledge of anatomy is amazing. I found it a fun read. Worthwhile! Great information, some of it above the average education level but not so pedantic as to be incomprehensible. Lots of information. Made me take a second look at the history of bodies. Good read. -Awesome insight and evidence for evolution of human structures, organs, and molecular biology. -This book increased my understanding and awe of this living planet. Shubin connects our deep evolutionary history with our current anatomy and structure. I really enjoyed learning about paleontology, how fossil research works (and why it is so important) and the emerging integration of genetic with fossil research. 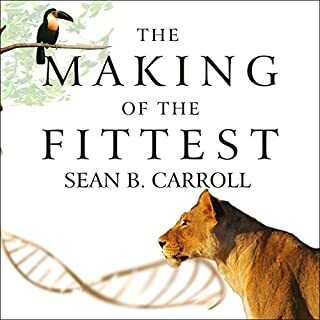 In his next book I hope Shubin spends more time drawing larger connections between his field and the larger project of evolutionary biology and evolutionary psychology. It would be great to bring his deep evolution story about our earliest development into the world of behavior. Shubin is a good writer and an accomplished scientist. Highly recommended. Superb. A grand overview meticulously illustrating connections that only intimate knowledge of many and disparate fields brings. The book was certainly informative, though it lacked the profundity or narrative of some other non-fiction works (ie. the Selfish Gene, Viral Storm). I certainly learned a lot anatomically, but I never truly felt "hooked." Nonetheless, I would recommend this to anyone new to (or even well-versed in) evolutionary biology. It was certainly worth the listen. Your inner fish, what a great book this is!! Neil Shubin is a professor of paleontology, the study of old bones. He has a particular expertise in fish, that's the reason for the title. But he could have chosen any animal in the heritage line of mankind to make his point, as long as it was sufficiently far in the past (say 300 million years). The gist of the book: evolution does not create entirely new beings that better fit the environment, but rather, repurposes creatures for a changing environment. Evolution in this sense can be compared to a house which has been renovated many times, in which bedrooms become bathrooms but still retain the old plumbing. Doors are used as windows and floors might get strengthened over time, but the basic layout cannot change much. This has benefits (build on what works in the past), but also drawbacks. The main one being that you cannot start anew and throw away unnecessary complexity. Humans are very complex, but some of it is just a burden. For example, the way our nerves twist and turn through the human body is the result of nerve-ends (sensory, muscular or organs) that were in a different place in our ancient ancestor beings. With a more direct route from brain to nerve-ending. Shubin explains how certain parts of our body have developed through the main evolutionary steps. Our bone structure, or eyes and ears, our brains itself. And proofs that indeed, we have a fish inside us. - ancient meat eaters (sharks) have wide jaws, levered through extra bones in the jaw. These extra bones have mutated over time to the ear, in which certain elements have 2 and humans have 3 bones (hammer, anvil, and another one). The animals with 2 ear bones have an extra jaw bone. In this way, all (I guess) skeletal creatures have a similar basic structure. Same with eyes, where the basic sensor is identical for all 'seeing' creatures. This is how evolution re-uses elements of what worked before. Shubin is also a good storyteller, so the book is not a dry telling of the facts. I will definitely try Shubin's other book which goes back even further in time. We humans have bodies that are unique in many ways. But we also share similarities with every other animal on the planet, including some of the oldest creatures ever to walk, swim or wiggle on earth. 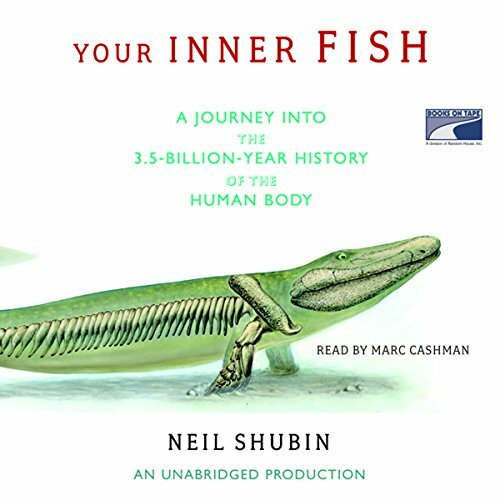 That's the central theme of Neil Shubin's Your Inner Fish, which uncovers striking parallels between our bodies and those of reptiles, fish, worms and even bacteria. Why do all mammals have three middle ear bones? How is it that every land-dwelling creature has four limbs with a similar arrangement of bones? This book probes these and other questions, showing how biologists, paleontologists and geneticists are uncovering answers. 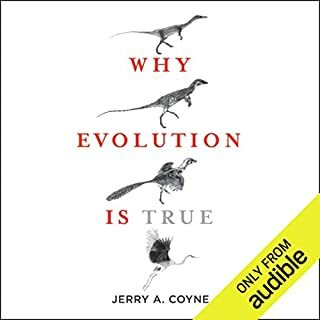 From listening to this book I learned why men are prone to suffer hernias (blame sharks), why we get the hiccups (blame fish and tadpoles) and how we came to develop color vision (thank primeval forests with a rich palate of things that were good to eat). Shubin's infectious enthusiasm for science and discovery drives the narrative. 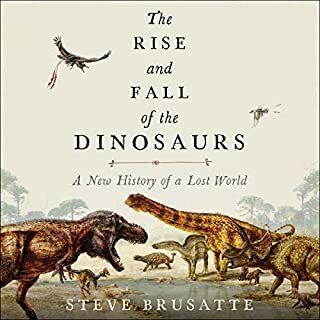 He recounts an astonishing story of how we can use the similarities between animals, and the timeline of when and where certain features developed, to find new fossils linking different kinds of creatures. In 2006, Shubin and his team discovered tikaalik, a fish with primitive, limb-like fins it could use to do "pushups" and poke its head out of the water. 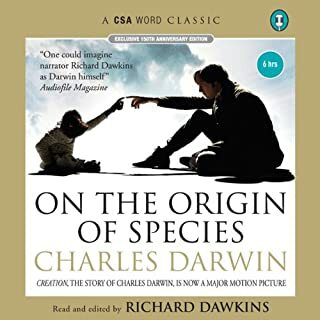 I admit to feeling lost at times and needing to rewind large sections of the audiobook, which I blame on my own ignorance of genetics and embryology rather than on the author. Once I get more science reading under my belt, I'll likely return to this book, and I also plan to watch the PBS series of the same name. I expected this book to delve into the implications of the evolution from water-dwelling to land-dwelling organisms and relate it more tightly to human anatomy--but that never really materialized. A good quick listen for paleo fans and the excitement of discovery but not so much here for human anatomists.